Strict targets, waterproof processes and elaborate work/life programs – all of these contribute to D&I. However, without a deeper understanding of the corporate and leadership culture, your company will not achieve sustainable improvements. Gone are the days when D&I-focused adaptations of the HR process chain (recruitment, development and retention) allowed companies to make changes, improvements and progress. The introduction of a variety of instruments to reconcile work and private life advance as well. The question remains open to many: When and how will noticeable changes take place? After many years of underestimating the importance of corporate culture, some studies and even more practical examples have now brought up a new perspective. The corporate culture, and in particular the management culture, form elements critical to success for changes that are necessary for the use of diversity. Especially, the inversion applies: as long as unwritten laws (also called implicit norms or basic assumptions) in your organisation oppose the Propelling Performance Principle, neither D&I efforts nor work-life programmes show the desired effects. Nevertheless, many companies do not know the unwritten rules of their corporate culture well enough – because the conflicts with D&I are often not clearly discernible. The identification of implicit standards is a decisive and often first step in self-reflection and self-knowledge. Our work aims at creating the basis for a healthy and sustainable change as well as occasions for internal dialogues and discussions with appropriate analyses. Common questions include: How easy and accepted is it to make use of part-time arrangements, home office or sabbaticals or how do final selection decisions take place at the end of a formalised evaluation process? Diversity & Inclusion leads to success in your company only when the corporate culture you live, and experience shows a positive attitude towards differences. The daily, concrete implementation and thus the personal experience of D&I require appropriate behavioural patterns. When individual strengths in processes, in teams and by managers are positively considered and actively involved in your company, the added values of the Propelling Performance Principle unfold. Here, the term ‘inclusion’ stands for effective cooperation, team performance and the highest leadership quality. With our operationalized approach to D&I, both employees and executives, as well as the company as a whole, benefit from the concrete use of diversity:ENGINEERING D&I. E.ON emerged from different companies, so that Diversity is key to the integration of our group on the one hand, and it is part of our corporate identity OneE.ON on the other hand. In bringing together experts and concepts from the U.S. and Europe, European Diversity Research & Consulting proved their competence in intercultural presentation and in facilitating our global development process. The expertise of European Diversity Consulting provides valuable assistance in the design and implementation of Diversity events and meetings. European Diversity brought many important strengths to our programme of Diversity focus groups and workshops. Particularly important to us were their depth of experience in the German market; their ability to offer seamless service across Germany, the UK and Central Europe; the thought leadership offered by Michael Stuber as programme leader, and the fact that all aspects of the programme were closely managed by Michael himself, ensuring quality and consistency. Working with European Diversity, Research&Consulting was a great experience for me. It was the first time that I felt that an external organization understands very clearly the challenges of the business, finds the right approach to introduce the topic of diversity and inclusion and makes it clear and tangible. They speak the right business language and they are flexible enough to adapt to global frameworks and make sure that all regional initiatives are aligned to that. It is also clear that this organization has the right background to support companies in their journey towards diversity and inclusion, they can relate to other companies and best practices. Last year we launched a change process in order to focus our diversity activities and release new potentials. Mr. Stuber accompanied this process with great professionalism. His extensive technical and methodological expertise, his experience with countless other global companies, his clarity and openness as well as his holistic approach has convinced us. With "head, heart and hand", he has helped us to bring the launch of this comprehensive process to success. Swiss Post faced an organizational development process by realigning the Diversity Management approach. The main task was to evolve our hitherto pursued focuses on Gender and Communication into an integrated and holistic concept. Who could support us effectively with the necessary know-how but also with an instinct to win people? 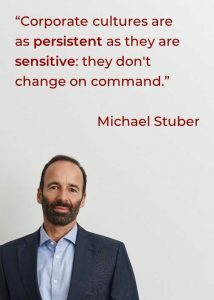 Michael Stuber makes the difference. With his background, his foresight and his empathy, we managed to position Diversity Management as a business relevant topic. European Diversity provided us with extremely valuable input and expertise as we are consolidating our various D&I programmes into a new global diversity strategy. Their years of experience with other leading companies as well as their international perspective and thorough understanding of relevant models allowed us to develop a solid business-driven approach and build robust stakeholder buy-in. European Diversity has been supporting our HSBC Continental Europe D&I Committee since January 2012. Their international experience and knowledge of the external market was hugely valuable to our business and HR members of the committee. As a consultant, Michael Stuber has helped us finding effective approaches, also in the restructuring of that committee to make it more action focused as well as aligned with business and corporate frameworks. We are grateful for the support and look forward to continue working together in our efforts to increase diversity across the organisation and help drive engagement through inclusion. KfW goes through a holistic modernisation process targeted on strategic focus, professionalisation, efficiency and customer orientation. This also includes corporate culture and in 2012 the KfW Executive Board approved a gender balance concept as one key element of this renewal process, which was honoured with the German Human Resources Management Award in 2013. I thank Michael Stuber for his professional support in the design and the adoption of that KfW framework. Michael Stuber combines high technical and methodological expertise with authentic persuasion. With this skill-set he has consistently focused on the alignment of our gender balance concept to the sustainable cultural change process. At the same time, he also recognised requirements in other areas at KfW and hence contributed to a credible integration of gender balance in the overall modernisation.